Anshu Jamsenpa, the Indian Mountaineer from Arunachal Pradesh had a special audience with His Holiness The Dalai Lama at Radisson Blue Guwahati. His Holiness having known her several mountaineering feats to her credit said, ‘your achievement is the testimony of your hard work, firm determination and a strong belief in yourself”. His Holiness hugged her warmly and blessed her when Anshu sought blessings for her future endeavours. The meeting also marked the flag off ceremony of Anshu Jamsenpa’s Double Ascent Mt Everest Expedition 2017. 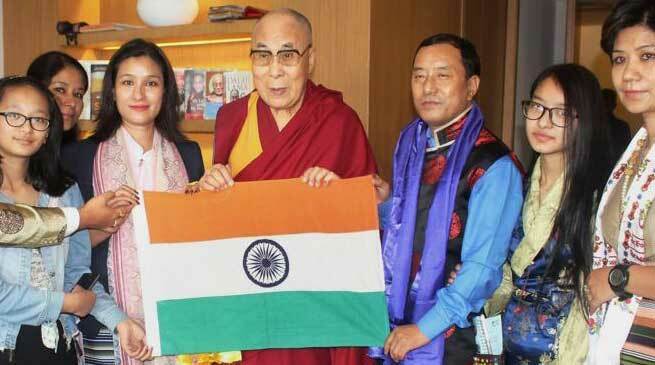 Tsering Wange President of Arunachal Mountaineering & Adventure Sports Association offered the Indian tricolour flag to His Holiness which was handed over to Anshu to be unfurled on the top of the world Mt Everest. Anshu presented a photo frame of her earlier successful summit to Dalai Lama as a token of love and respect. Anshu is in quest to better her own national and international mountaineering records. Mountaineering being one of the most dangerous and costliest adventure sports, some corporates and public sector undertakings like North Eastern Council, State Bank of India, Topcem Cement, NEEPCo Ltd and NRL ltd has come forward to support her mountaineering endeavours.